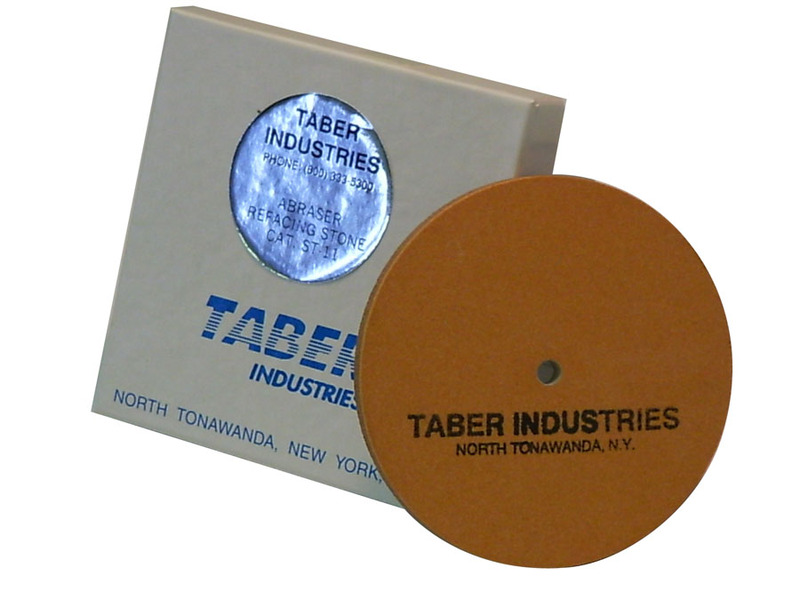 As Genuine Taber® abrading wheels are used, they slowly disintegrate exposing fresh abrasive grains. When testing certain materials however, the wheel faces may become clogged as a result of the adhesive character of particles worn off the specimen. 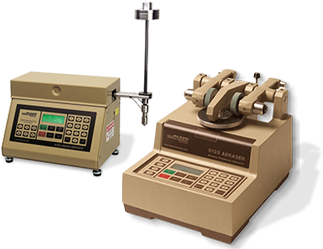 This changes the abrasive characteristics of the wheel and may impact test results. To reduce this variation, the working surface of abrading wheels must be cleaned and refreshed prior to use and if necessary, at regularly defined intervals. This process is referred to as refacing. The following chart lists the recommended refacing medium for Taber wheels. We do not suggest refacing CS-0 (rubber), CS-5 (felt), S-35 (tungsten carbide) or S-39 (leather) wheel sets. Attempts to do so may damage the wheel. The Taber® Diamond Wheel Refacer - Model 250 allows you to true and completely renew the working surfaces of Taber abrading wheels. Wheels are secured to a flanged extension of the motor shaft, and enclosed by a hinged cover for safety. A diamond tool, mounted on a shielded traverse slide, permits light cuts across a pair of wheels providing identical wheel diameters. Attaching the abraser vacuum to the receptacle hole of the refacer will enable you to draw off the abrasive cuttings and maintain a clean work area. Wheels may be refaced as often as required, down to the minimum usable diameter of 1 3/4" as indicated on the wheel label. Calibrade® wheels such as the H-10, H-18 and H-22 are diamond trued before leaving the factory. Calibrade wheels should be refaced with the Diamond Wheel Refacer whenever they show signs of being out of round, crowned or clogged with abraded material. Taber recommends refacing previously used Calibrade® wheels whenever starting a new test, changing to different test material, and whenever there is a tendency for the working surface of the wheels to pick up excess materials. When refacing the H-38 Calibrade wheels, the optional multiple point diamond tool must be used. Calibrase wheels such as CS-10 and CS-17 are typically are refaced with the S-11 Refacing Disc. 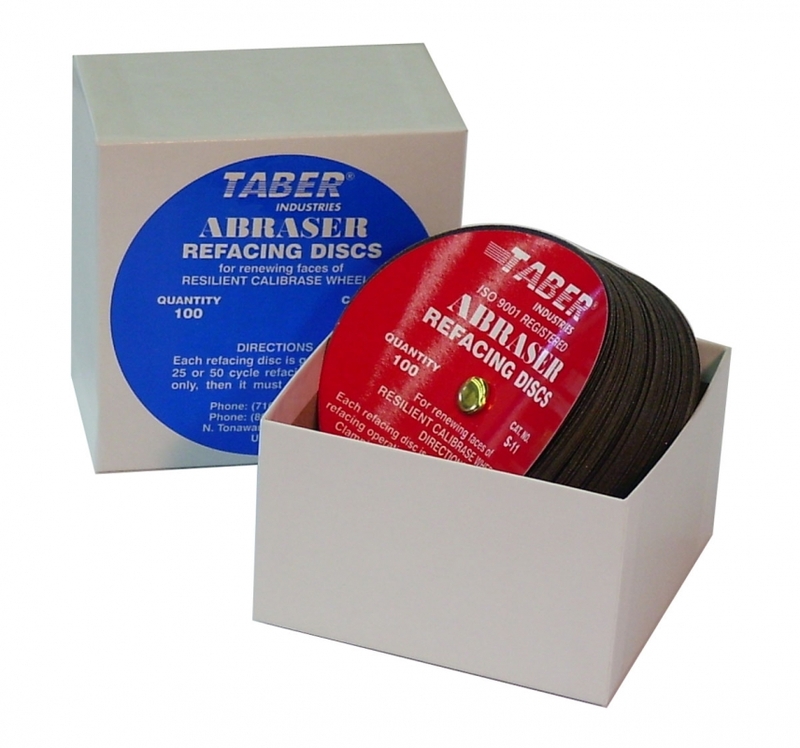 Sold in packages of 100, the S-11 refacing disc is a 4" diameter, 150 grit abrasive paper. The useful life of a S-11 Refacing Disc is only 1 refacing. Regardless whether the disc has been used for 25 or 50 cycles, the refacing disc should be discarded. Refacing with a used disc may change the wear coefficient of the wheel faces, and invalidate your test results. When using CS-10F wheels to evaluate transparent materials, the ST-11 refacing stone is used to resurface the wheels. The ST-11 refacing stone is a vitrified product that is 4" diameter x 1/4" thick with a 1/4" center hole, and has both sides manufactured with a 180 grit (often designated as "fine"). Original ST-11 refacing stones were a duplex stone with one side 180 grit and the opposite side 80 grit. Mount the wheels to the instrument. Use the same weight on the abrading arms as stated in the test method you are following. Affix the S-11 refacing disc (ST-11 refacing stone) to the specimen platform. For S-11 refacing discs, affix using the clamp plate and nut, and clamp ring (no clamp plate or clamp ring is required for the ST-11 refacing stone). Lower the abraser arms until the wheels rest on the refacing medium. Place the vacuum pick-up nozzle in position and adjust it to the appropriate distance. Refer to the test method for the proper gap. If none is stated, use 6.5mm. Set the counter to 'zero' and adjust the vacuum suction force to 100. Resurface the wheels by running them for the appropriate number of cycles against the refacing medium as indicated in the test method or as stated below. New Set of Wheels (Break-In Procedure) - Before using a new set of Taber Calibrase wheels, two (2) refacings of 50 cycles each are recommended to ensure perfect contact of abrading faces with specimen surface. Starting a Test with Previously Used Wheels—Before testing a specimen with previously used wheels, ensure the wheels have been refaced on a new refacing disc. When the previous test was short in duration (<1000 cycles), refacing 25 cycles is sufficient. When the previous test was 1000 cycles or more, a refacing of 50 cycles is recommended. Resurfacing During Testing—To maintain consistency and avoid clogging of wheel faces, the wheels may need to be refaced periodically during the test. For tests of 1000 cycles or more, refacing every 500 cycle interval has been found to be sufficient for most materials. Remove the specimen and reface the wheels for 25 cycles. The sample should be carefully replaced on the specimen holder after refacing of the wheels. To prevent the integrity of the test from being jeopardized when removing and replacing flexible samples, specimens may be affixed to a mounting card. NOTE: To determine if more frequent resurfacing is required, plot the total mass loss every 50 cycles. If a significant negative change in slope is observed prior to 500 cycles, the point at which the slope changes determines the resurfacing frequency. The resilient composition of Calibrase wheels makes them subject to slight changes of form. When operating the abraser, out of round wheels may be detected by the slight up and down movement of the abrading arm. This condition can be corrected with the Diamond Wheel Refacer. Truing Calibrase wheels on the Diamond Wheel Refacer will remove some of the abrasive grain from the wheel faces. To re-establish the normal abrasion coefficient, each wheel set should be given two refacings of 50 cycles each using the S-11 refacing discs.